วันพุธที่ 06 พฤษภาคม 2015 เวลา 03:40 น.
Kathmandu Durbar Square in front of the old royal palace of the former Kathmandu Kingdom is one of three Durbar (royal palace) Squares in the Kathmandu Valley in Nepal, all of which are UNESCO World Heritage Sites. 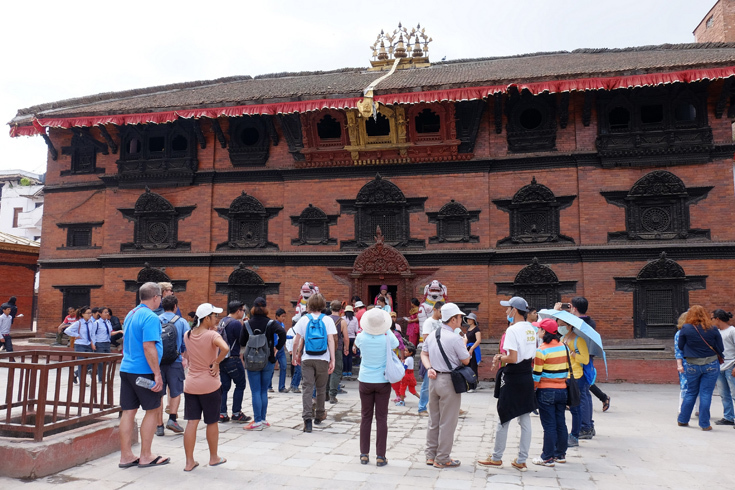 Several buildings in the Square collapsed due to a major earthquake on 25 April 2015, Durbar Square was surrounded with spectacular architecture and vividly showcases the skills of the Newar artists and craftsmen over several centuries. 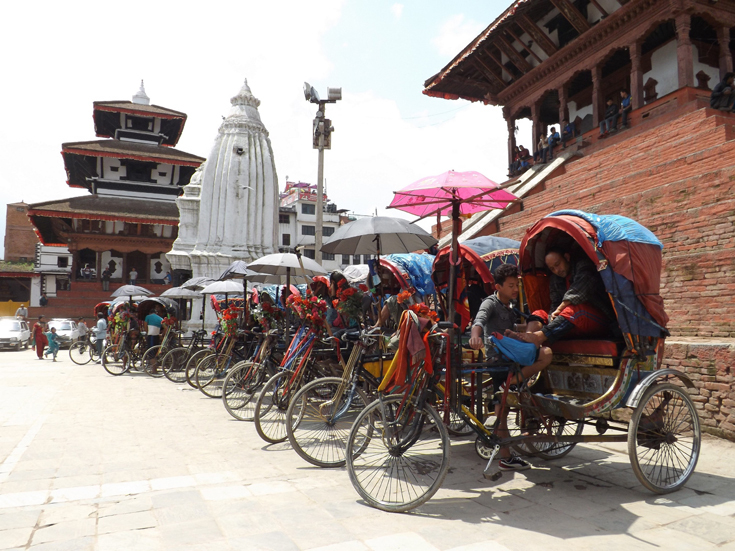 The Royal Palace was originally at Dattaraya square and was later moved to the Durbar square. 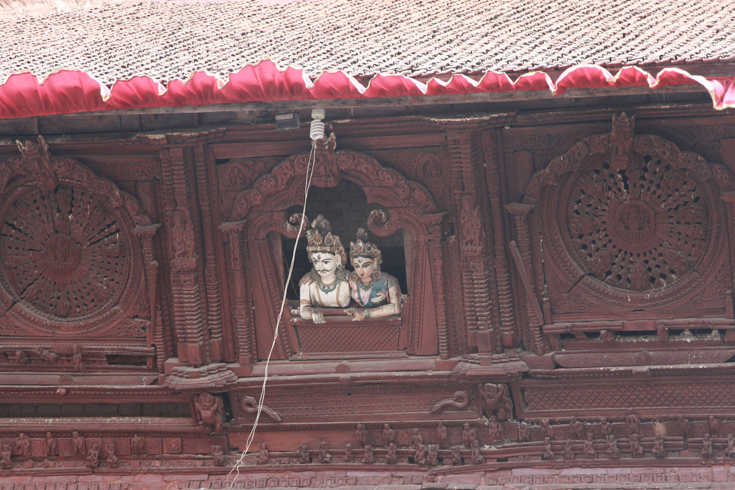 North of the Jagannath Temple is the figure of Kala (Black) Bhairab. Bhairab is Shiva in his most fearsome aspect, and this huge stone image of the terrifying Kala Bhairab has six arms, wears a garland of skulls and tramples a corpse, which is symbolic of human ignorance. 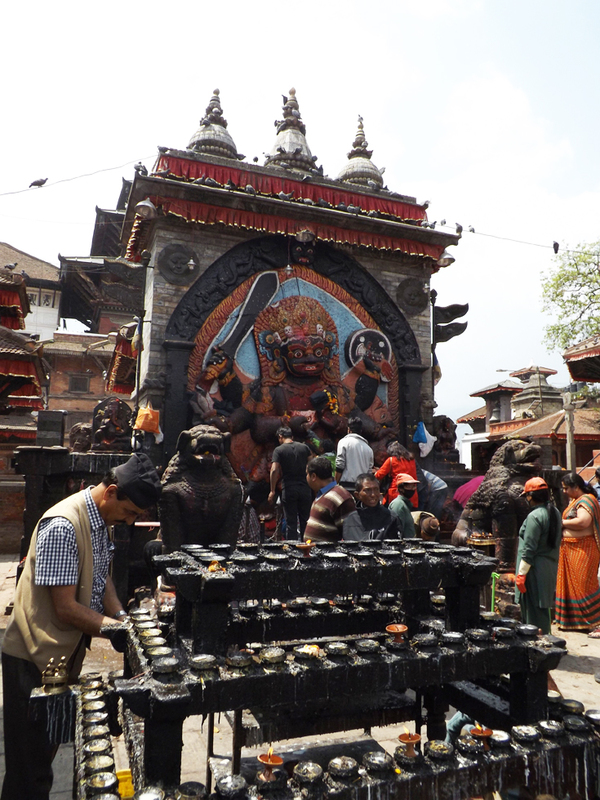 It is said that telling a lie while standing before Kala Bhairab will bring instant death and it was once used as a form of trial by ordeal. 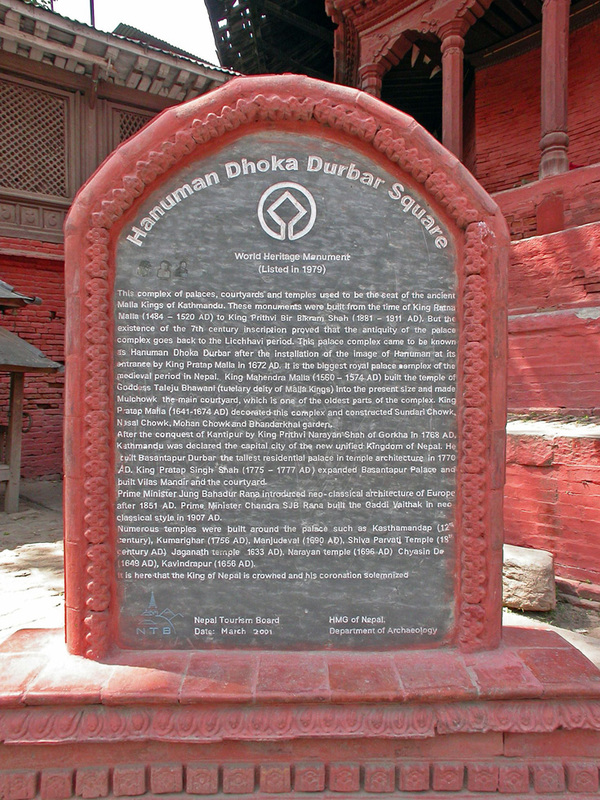 The figure is said to have been brought here by Pratap Malla, having been found in a field to the north of the city. The image was originally cut from a single stone but the upper left-hand corner has since been repaired. 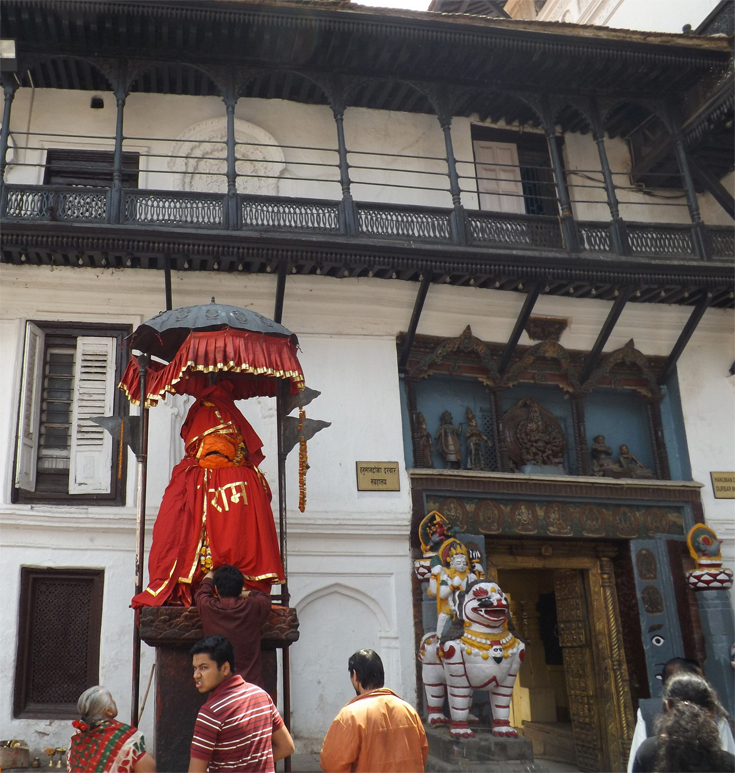 Cloaked in red and sheltered by an umbrella, a Hanuman statue marks the dhoka (entrance) to the Hanuman Dhoka and has even given the palace its name. 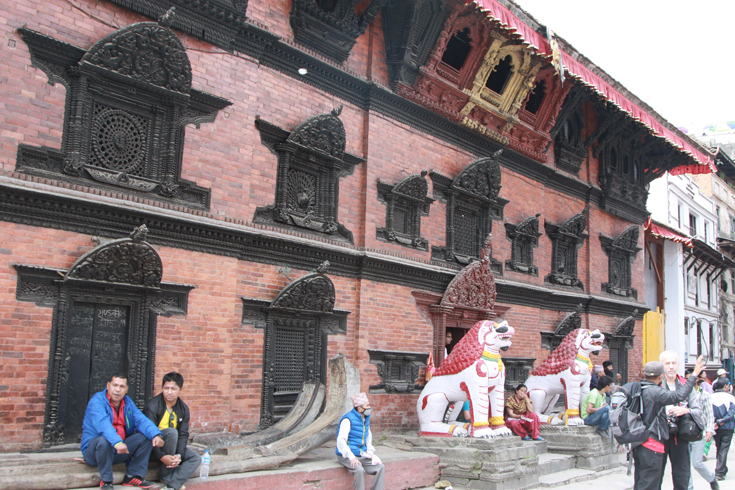 At the junction of Durbar and Basantapur Sqs, this red-brick, three-storey building is home to the Kumari, the girl who is selected to be the town’s living goddess until she reaches puberty and reverts to being a normal mortal. Inside the building is Kumari Chowk , a three-storey courtyard. 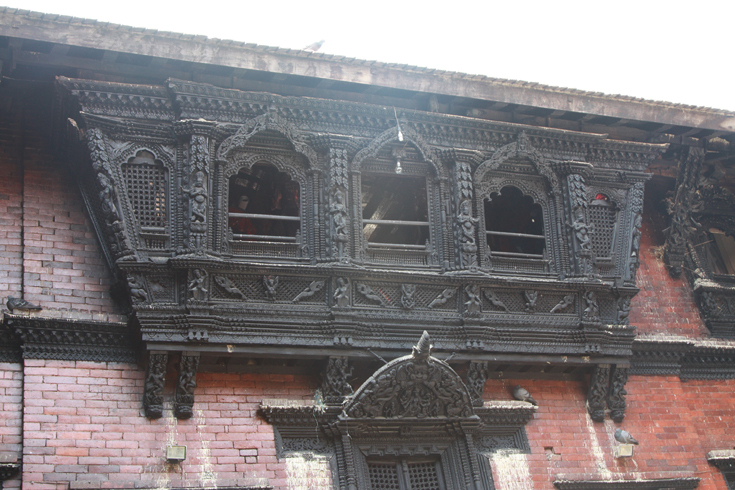 It is enclosed by magnificently carved wooden balconies and windows, making it quite possibly the most beautiful courtyard in Nepal. The Kumari generally shows her face between 9am and 11am. Photographing the goddess is forbidden, but you are quite free to photograph the courtyard when she is not present. 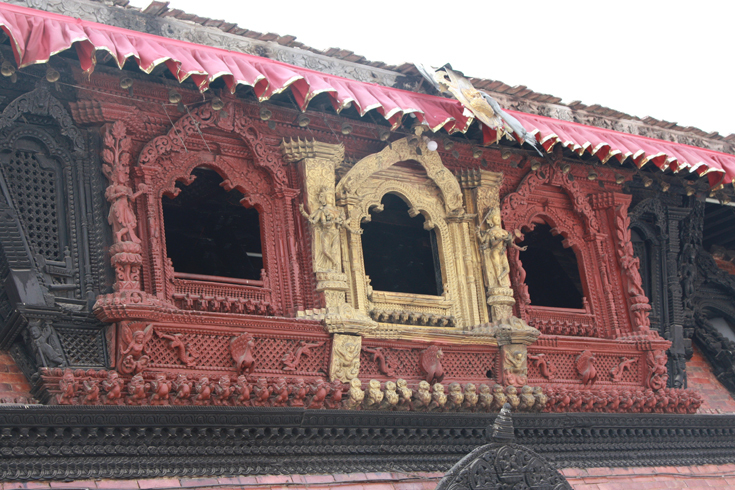 The Kumari went on strike in 2005, refusing to appear at her window for tourists, after authorities denied her guardians’ request for a 10% cut of Durbar Sq’s admission fees! The building, in the style of the Buddhist vihara (monastic abodes) of the valley, was built in 1757 by Jaya Prakash Malla. The courtyard contains a miniature stupa carrying the symbols of Saraswati, the goddess of learning. Non-Hindus are not allowed to go beyond the courtyard. 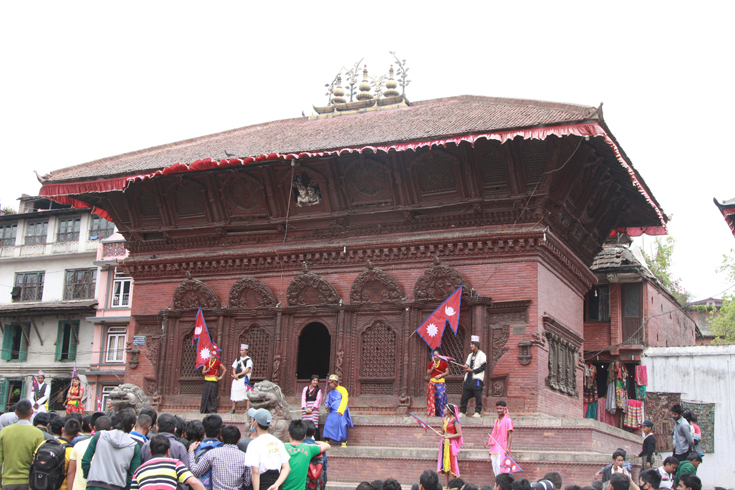 The large yellow gate to the right of the Kumari Bahal conceals the huge chariot that transports the Kumari around the city during the annual Indra Jatra festival. Look for the huge wooden runners in front of the Kumari Bahal that are used to transport the chariot. The wood is painted at the tips and is considered sacred. You can see part of the chariot from the top of the nearby Trailokya Mohan Narayan Temple steps. After checking out a number of the articles on your web page, I truly like your technique of blogging. this site, as I experienced to reload the site many times previous to I could get it to load correctly. They're very convincing and can definitely work. Nonetheless, the posts are too quick for starters. The cheap hotels in tijuana: http://www.oyama.cn.com/home.php?mod=space&uid=800245&do=profile International Airport is 14 minutes away.